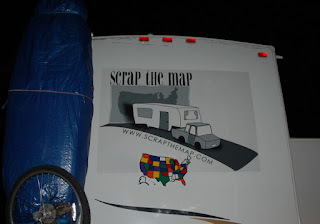 We put our fabulous new state map sticker with solid colors on the back of the RV tonight. We LOVE that it has solid bright colors and think it looks so much better than our boring license plate one on the side. Those are all we could find, and everyone we met agreed that the solid colored maps were better. It's much easier to see where you have and haven't been and is less cluttered. But they were discontinued and we couldn't find them anywhere. So we were very happy when another traveling family decided to do something about it! Signs of Life in Colorado now offers an RV Travel Map with solid colors. They even offer customization if you'd like. The sticker is high quality and easier to work with than our Camping World map. I love that the state abbreviation is on the empty map in black and also on the colored stickers in white. There's also more room to put each state in. The Camping World map was very tight with no wiggle room. AND they're easily repositionable if you make mistakes, which I did, a lot, working in the dark, with a headlamp. :) I don't recommend working in the dark, but I do highly recommend the RV state map with solid colors! Since the Scrap the Map year-long tour is officially over, we removed the sponsors, although I AM going to continue to scrap the map. Hopefully a little faster, because I have many states left to scrapbook!